I took an applique class at the end of January at the local quilt shop. I want to make wall hangings for an area of the living room that has a lot of wall space. 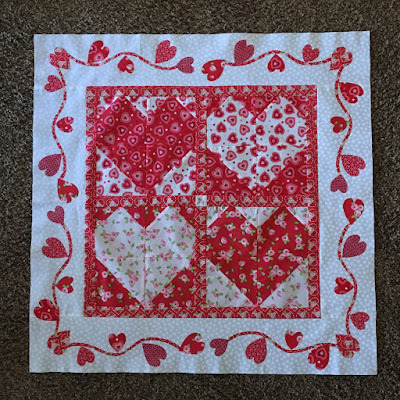 I decided to make a Valentine wall hanging. Things have been busy because I've been preparing a presentation but I decided to take a break and work on this. I spent a week on this and it moved along swiftly in the beginning. I thought I would have it done quickly. Then came the applique part. Preparing the pieces and stitching. (I did the stitching after this picture.) I seriously entertained not bothering with the heart border. In the end, I'm glad I did it. The funny part is, I didn't finish it until tonight. I sewed on the sleeve on the back and had it hanging before I made dinner. It is done. I appliqued! That class was worth it!